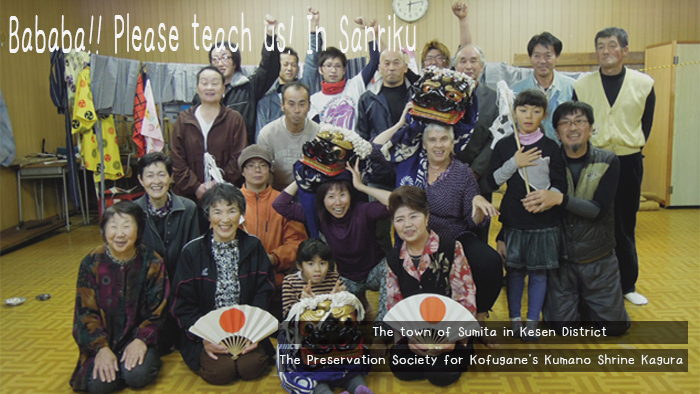 We invited community dance artist Cecilia Macfarlane from England and had one month of residencies in earthquake-stricken areas, such as Kessennuma in Miyagi prefecture, Otsuchi and Ofunato City in Iwate prefecture. As well as learning each region’s local folk performing arts, we were able to meet with local people, talk, and make deep connections with the region’s culture. 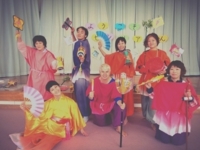 Japanese dance artists also participated in each location. 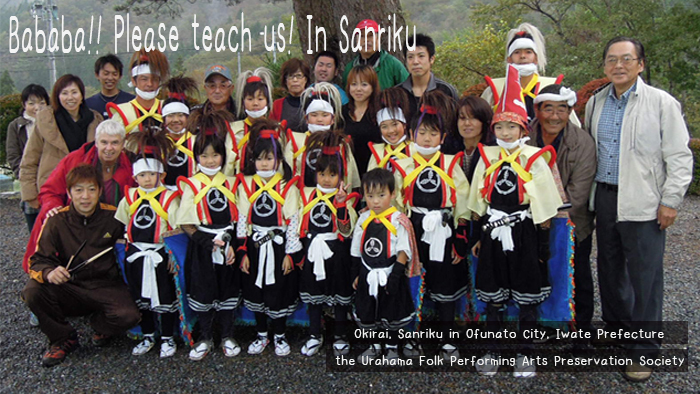 By coming directly into contact with the importance of local performing arts and with the depth and diversity of Tohoku’s culture and art, learning, and listening to local people, I thought that from now on, we can make an organization for people from Japan and all over the world to come to Tohoku to learn local folk performing arts and to hold international arts festivals with local folk performing arts at their core in these earthquake-stricken areas. The Kanazu Kagura dance “Torikomai,” (Chicken Dance) which has decreasing numbers of successors due to an aging population. 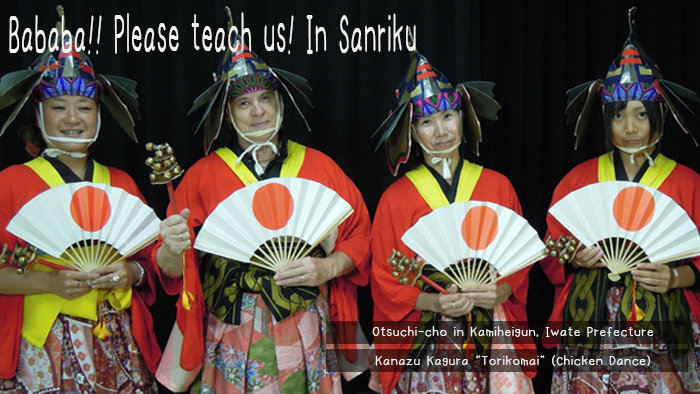 We learned “Torikomai” from Misaki Ota, who learned dance naturally, surrounded by older men and women who are successors of the Kanazu Kagura. We learned the “Torikomai” with the members of the “Kanazu Kagura Club,” which is made up of young women and centered on Ms. Ota. Lastly, we tried a community dance workshop with club members, and everyone had a good time. Also, outside of practicing, we were able to listen to her grandfather speak about Kagura. 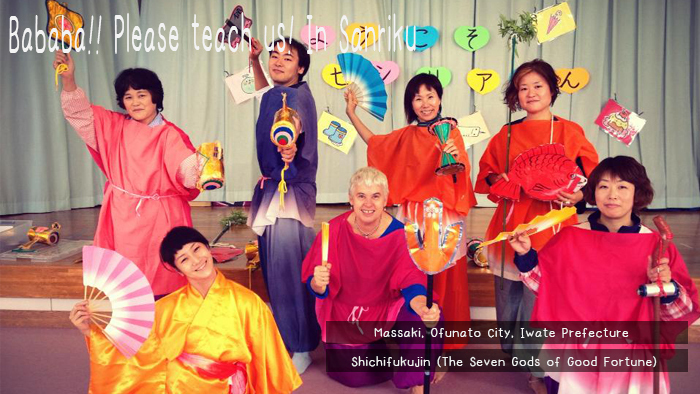 We learned the local folk performing art “Shichifukujin” (The Seven Gods of Luck”) from pre-schoolers, under the cooperation of the teachers at Massaki Pre-school!! 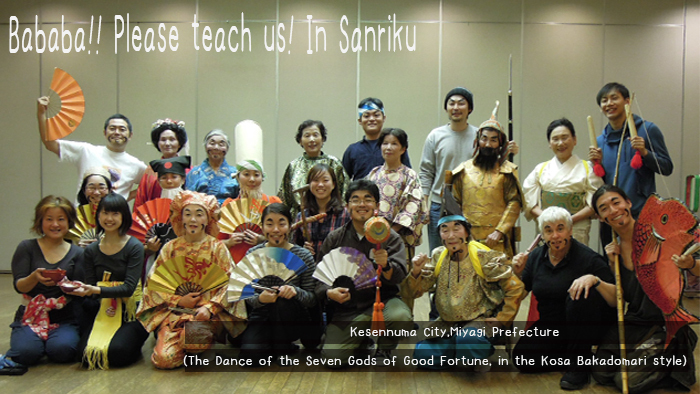 We learned “Shichifukujin” from the pre-schoolers for two days, and for the next two days, with the children we learned a folk song from the same region called “GoIwai” (“Celebration”) from Mr. Takashi Takeda, Cecilia made choreography for the song, and on the 5th day, November 2nd, we held a recital in which we showed our “Shichifukujin” and the children danced while singing “GoIwai.” They presented the “GoIwai” interpretive dance and “Shichifukujin” with the organization members, as the parents and local people watched over the children. We learned from Mr. Chikara Furumizu, a representative of the Shishi Odori (Deer Dance), which has been passed down in Okirai. 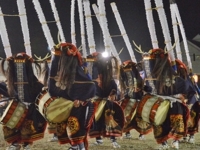 First, in order to get the timing and pauses into our bodies, we remembered the rhythm through an older oral method called “Kuchi Shouga,” and then we learned until the steps, drumming, and dance. We could come into contact with the essence of a continuously handed-down folk performing art in the fresh, early autumn air in a mountain village. At the end, they let us practice in the authentic costuming. Copyright 2013~2014 NARAINIIKUZE. All Rights Reserved.